The Boys & Girls Club at Juvenile Hall is a truly exceptional program. Currently the Club is one of 13 in the United States that operates within the walls of a Juvenile Hall. A portion of released members are involved in the Targeted Re-Entry program which matches released youth with a Club case manager who then tracks them for a year to provide additional support after release from Juvenile Hall. The Re-Entry program has been hugely successful, as 71% of the youth in the program have not returned to the Hall. Copyright 2018. 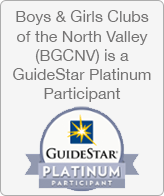 Boys and Girls Clubs of the North Valley - Maintained by Revsign and hosted by MC2 Design Group, Inc.